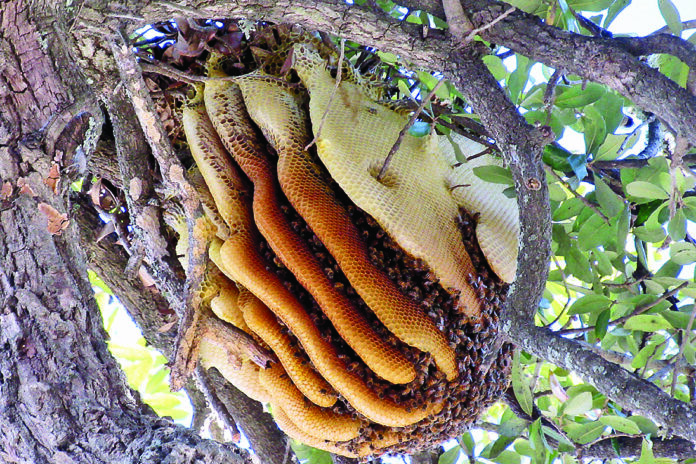 This honeycomb in a live oak in front of City Hall is causing quite the stir. First, it’s comb without being contained it a hive, and second, it’s over Second Street and hasn’t been noticed until now. Robert Beard, at right with Mayor Lee Posey, is an inspector for the street, and also a beekeeper. He said bees are usually dormant this time of year and their cycle is weather driven. One interesting fact about bees is even while dormant, they will leave the honeycomb to – umm, relieve themselves. “They don’t defecate in the hive or comb,” he said.